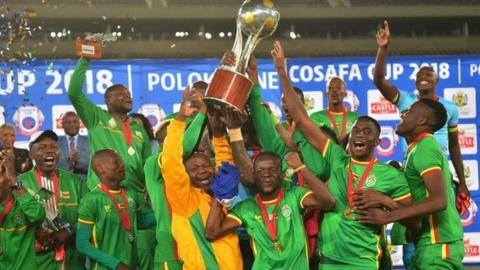 This year's Cosafa Cup is in danger of not being hosted after the Southern African regional body on Sunday accused Zimbabwe of reneging on an agreement to host the 2019 edition. This year's tournament was set to start just weeks before the Africa Cup of Nations finals, offering five countries from the region, who have qualified for Egypt, a unique chance to warm-up in a tournament setting. It now looks like Angola, Madagascar, Namibia, South Africa and Zimbabwe will lose out unless late hosts are found. In a strongly worded statement, Cosafa - whose president is former Zimbabwe Football Association (Zifa) boss Phillip Chiyangwa - accused Zimbabwe of breaching their hosting agreement and threatened disciplinary proceedings. "The venue for the 2019 edition of the Cosafa senior tournament, scheduled from May 25 - June 8, remains undecided," the statement said. "Zimbabwe Football Association is now in breach of their hosting agreement, signed by Zifa late in January 2019, and returned to Cosafa. "Following a board meeting convened on March 9 in Zimbabwe, Zifa reconfirmed their commitment to host the tournament in Zimbabwe, irrespective of whether they received government funding and guarantees. "Zifa management committed to presenting to Cosafa written confirmation of this decision no later than March 25. "Unfortunately they failed to deliver on the nominated deadline which has left Cosafa with no recourse other than to enforce their disciplinary procedures which process calls for Zifa to attend a disciplinary hearing scheduled on April 4 in Johannesburg. "The hearing will be handled by Cosafa's independent judicial body, and the outcome and punitive action will be handed down within 48 hours of the hearing. "Cosafa is particularly disturbed by the management of the process by Zifa as 2019 is a critically pivotal year for football in the sub-Saharan region. "For the first time in 21 years, five Cosafa member countries have qualified to participate in the continental showpiece, including Zimbabwe's Warriors," the statement added. It was not signed by Chiyangwa nor general secretary Sue Destombes. In February, Zimbabwe sports minister Kirsty Coventry already said there would be no government support for the 14-nation tournament. "We want to make sure that when we do host an event of this magnitude, that we are fully prepared, we have good timing. We just do not feel that that was really given to us this time around," she said. But Zifa's new president Felton Kamambo, who took over from Chiyangwa after a disputed election, had hoped to change the government's mind and get the financial backing to host the event. "Our plans to host the Cosafa Cup hit a snag. We were hoping for a review of the decision, but that did not succeed,'' said Kamambo at the weekend, without giving more details. South Africa have staged three of the last four Cosafa Cups with hosting costs taken care of by provincial government. But with elections on 8 May, it would seem difficult for such a commitment to be quickly made this time round.